I purchased two tickets at $100 each for this event. My house mate, who does not share my adoration of Martin Sheen, refused to go with me, so I invited a friend, Ann, who is a retired high school English teacher. She accepted and agreed to drive the 27 miles to Brentwood. I gave her a copy of the November issue of "Empire" magazine, which had a marvelous article on Martin. 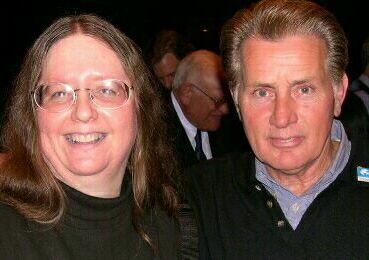 I can't really explain how great it was to actually meet Martin Sheen. It was very surreal, but I will try to describe the evening. Martin was to be the recipient of an award from the Office of the Americas, an organization for peace and social justice. He gave them their startup money 19 years ago and the event was to honor him and others. It was a two-part program, dinner followed by the awards presentation. It was held at University Synagogue in Brentwood, which is near UCLA. Ann and I arrived about 5:15 and dinner was scheduled for 6:00 pm. Ann went in to the dining area and found the table with the "Reserved for Martin Sheen" sign on it and grabbed us some seats at the next table. Shortly thereafter, I received a call on my cell phone from my friend, Darla, who also was coming. We located each other in the crowd and then looked over the silent auction items. I bid on an autographed cast photo from The West Wing. (Alas, I didn't get it, but I had the high bid until almost the end.) We kept looking for Martin, but we didn't see him. Shortly after 6:00, they opened the buffet, so we got our food. Mr. Sheen had not appeared, but there were two men at out table who had been arrested with Martin, and they were happy to share their stories. We finished our meal and Ann excused herself to go find seats for the program. I stayed in the dining room, talking with Darla, but we finally decided we should claim our seats for the program. Just as I stepped out of the dining area, I almost walked right into Martin. Regaining my composure (well, almost! ), I went back into the dining area to let Darla know that Martin had arrived. We went out, but couldn't see him through the crowd. Going back into the dining area, we spotted a solo figure leaning over a plate of food. It is Martin Sheen. There is no way that I am going to disturb him. But Darla asked our dinner table companion, who had said that he knew Martin, if he would ask him if we could speak to him. I wanted to run right then, but I didn't. We waited and worked with our newly acquired digital cameras, seeing if we could take some candid pictures without the flash. Then someone dimmed the lights and we just stood there in the shadows, uncomfortable, but wanting a chance to meet our favorite actor. After about fifteen minutes, Martin finished his dinner and got up to go to the program. As he was leaving, I guess he remembered that we were waiting to meet him, and he walked over to me with his hand extended. I was told later that he said, "Hello, I'm Martin." All I remember saying was, "thank you," and that his hand was very cool when compared to my rather hot and clammy one. He then had to walk around me to shake Darla's hand, since I had lost the power to move my feet. He smiled and left the room. We squealed like teenagers and said that alone made the price of admission all worth it. We then found the seats that Ann was holding for us and sat down to enjoy the program. I had shaken hands with Martin Sheen; I could die happy. As we settled into our seats, it was pointed out to me that Martin was in the same row as we were, but on the opposite side of the room. He had his reading glasses on and was probably going over his speech. About an hour into the program, Martin was introduced and received his award. He then gave a speech with his reading glasses on. I can't remember much of what he said, but he did mention that the character of Jed Bartlet was created as a Democrat, with a degree from Notre Dame, and was a Catholic and a smoker. He said that he had made a pledge to quit smoking by Thanksgiving. I let out a scream of approval and started a round of applause. He ended the speech with the poem "My Country Awake" by Tagor and received a standing ovation, seemingly overwhelmed by the obvious affection and admiration everyone had for him. The program was ended by everyone singing "We Shall Overcome". As soon as the program ended, many people swarmed the stage, including my good friend, Ann. I had given her a copy of the November Empire magazine (from the UK) and a Sharpie, so I assumed she wanted an autograph. I had pretty much decided that I had made a big enough fool of myself for one night, so I just stayed back to talk with Darla and waited for Ann to return. When she finally appeared about twenty minutes later, I asked if she had gotten his autograph. Ann replied that, not only had she gotten his autograph, but a hug and a kiss as well. Well, at least I had gotten a handshake, but it paled somewhat in comparison. She said that Martin had not seen Empire magazine and couldn't even remember doing the interview. I told her that I had another copy of the magazine and she should give it to him. I also pulled out a "Vote Bartlet Prez" tee shirt and told her to give that to him, too. Ann then headed back to the stage. Well, more time passed, and there was still a huge crowd surrounding Martin Sheen. I thought maybe I should at least attempt to get a picture of Ann giving the items to Martin. So, Darla and I made it up to the stage, lingering there for some time until Ann almost got close to Martin again. Just then, some official types said they needed to take some pictures, but they would bring him back. Well, the pictures were taken, but Martin didn't make his way back to where we were, so we had to move. Again, we sort of lined up and worked our way through the crowd. Suddenly, I noticed Darla being escorted by one of the professional photographers into the arms of Martin, saying that she is a volunteer and wants to have her picture taken. I try to get a picture of this, but wind up instead with a picture of her getting a great big hug from Martin. Now I'm feeling a bit left out. I just stood there while Ann finally got near Martin again and gave him the magazine. She pointed to me and said that it was mine and that I wanted him to have it. Martin then said that he couldn't take my magazine, but I assured him that I actually had another copy at home and that I wanted him to have it. I retrieved the tee shirt from Ann and handed it to Martin, saying that I'd like to present it on behalf of all of my friends who absolutely adore him. Martin then said that he loves all of his "WingNut" fans. I quickly passed my digital camera to Darla. I NEVER have my picture taken, but I figured most people wouldn't believe this story, so I needed proof. I then found myself with Martin's hand on my shoulder. The picture was snapped and, as I was recovering from the flash, I found myself being hugged by Martin. Then I walked away, my feet hardly touching the ground. Martin is about 5'7", and he was casually dressed in a dark blue pullover sweater and those brown boat shoes he has been seen wearing lately on talk shows. His eyes are so blue, you are reminded of the ocean. He was very tanned and looking much younger than he appears on TV. His hair is reddish, but when you get close, you can see the gray. All in all, it was the evening of a lifetime. And one I will never forget.